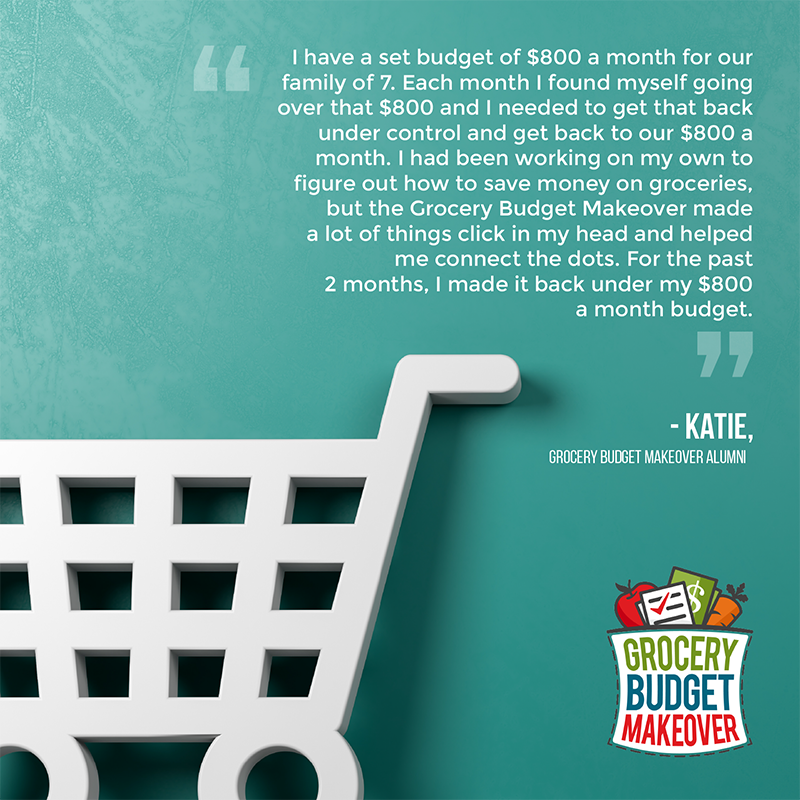 The Grocery Budget Makeover has helped people shave hundreds off their monthly grocery spending. I asked a few friends who went through the makeover this past summer to share their thoughts and experiences. You can read their words and hear their stories below. Please take a moment to listen, because my guess is you can relate to their situations and you want to see the same results they have seen! What made the Grocery Budget Makeover so perfect for me was that it was delivered in small, digestible bites. You carefully laid it out and walked me through the process. It really was a progressive walk through the grocery planning process. It was perfect for me because it wasn’t too much information at once. The thing that was most impactful for us as a family was having a plan for shopping and our meals. 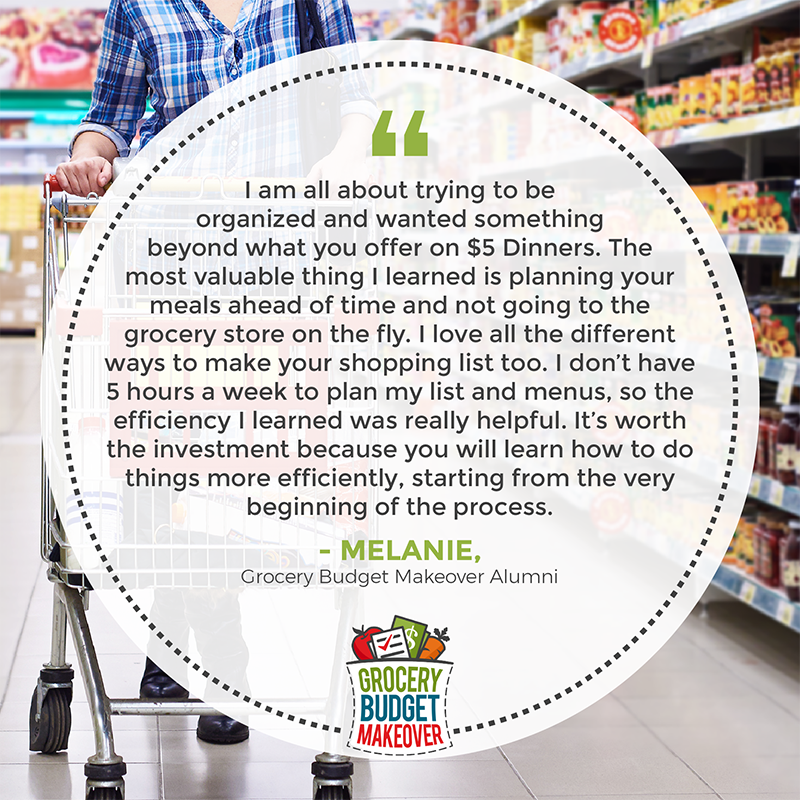 I am happy with the Grocery Budget Makeover program because it helped me to save money on groceries. There were many helpful tips in the program, some of which were new to me and some I already knew about but wasn’t sure how to put them all together to make it all work for me. This program showed me how to put all the pieces together and gave me the motivation to save money on groceries! The Grocery Budget Makeover helped me save $100 per month on my groceries so far and I think I can get my budget down even more as I fully implement all that I’ve learned. ~ Sue A. By breaking the elements of grocery budget savings down into bite sized weekly pieces and initiation challenges in line with each weeks lessons, I was able to see where I was wasting my efforts and money. I don’t know that I’ll ever be a “couponer” or CVS/Walgreens deal chaser but I have significantly reduced my grocery shopping dollars through the lessons taught in this course. Thank you so much! ~ Skylar A. 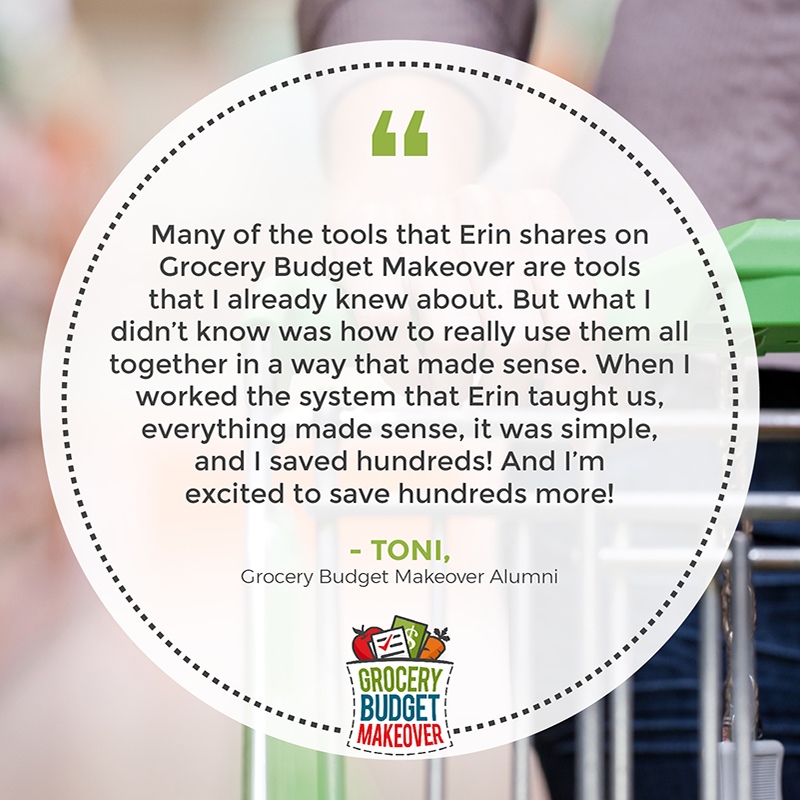 The Grocery Budget Makeover offers a focused, one step at a time program and you can go back and see the content at anytime. For me, I’m still spending the same amount of money ($430/month for food) on my groceries, but I’m able to buy more (to build my stockpile) with the same amount. The savings will show up in different ways. I have learned the importance of the basics of making a list and planning BEFORE you are in the grocery store parking lot made all the difference. The Grocery Budget Makeover changed the way I looked at grocery shopping and now there’s a peace to grocery shopping. Thank you for making grocery shopping easier for me. ~ Veronica Y.